LFO Delay with two LFOs for modulation. One filter on delay target or out target. Low resources taken. 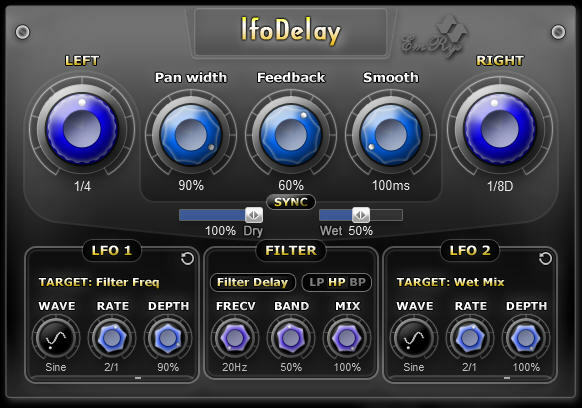 LFO Delay for unique delay effects. Two LFOs which can modulate: Delay Rate, Dry Mix, Wet Mix, Pan Width, Feedback, Filter Freq, Filter Bandwidth, Filter Mix. The LFOs working synchronously also can make phase shift by LFO reset automation. LFO reset to back LFO phase to start. LFO offset is value of modulated parameter. One filter Lowpass, Highpass or Bandpass. Can set to delay target or out target. Two host sync or free knobs for left and right side. Switching host sync / free with the corresponding values. Smooth transition to changing rate with no crackles, rattles or distortion. This time mean the minimum time to change delay rate. Smooth knob: useful if modulation or automation on delay rates it uses. Stereo enhanced by pan width. Rich rates with triplet and dotted. 40 cool presets with 10 distort presets.